CLEVELAND–(BUSINESS WIRE)–Directional Aviation announced today that its Principal, Kenn Ricci, has been inducted into the Living Legends of Aviation, a prestigious organization composed of men and women of extraordinary accomplishment in aviation including industry leaders, innovators, pilots and astronauts. Ricci, who was chosen by the current members of the Living Legends, was inducted at the 16th annual Living Legends of Aviation Awards Gala, held last night in Beverly Hills, California. Ricci’s induction continues a relationship with the Living Legends of Aviation that began when he received the Living Legends Lifetime Aviation Entrepreneur Award in 2017, an award that previously had been given to Sir Richard Branson of Virgin Atlantic, Fred Smith of FedEx and Herb Kelleher of Southwest Airlines. In 2018, the award was renamed the Kenn Ricci Lifetime Aviation Entrepreneur Award and presented to Robert T. Bigelow, founder of Bigelow Aerospace. 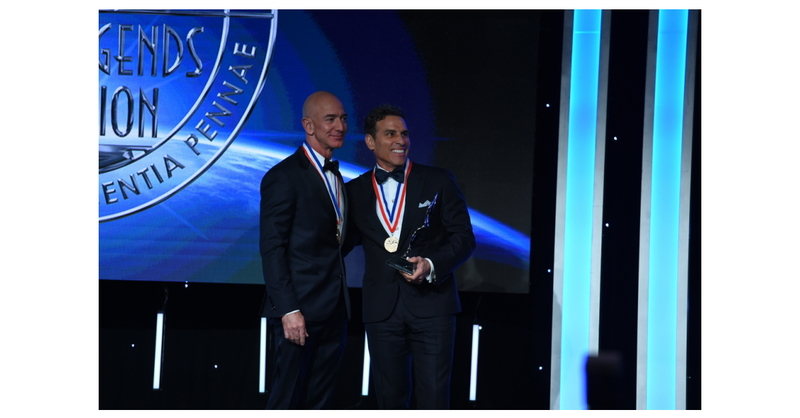 Beyond his induction, Ricci presented fellow 2019 inductee Jeff Bezos, founder and CEO of Amazon and founder of space exploration innovator Blue Origin with the Kenn Ricci Lifetime Aviation Entrepreneur Award from the Living Legends of Aviation. Ricci’s aviation career includes more than 6,000 hours in the air as a pilot of type-rated aircraft and service flying Bill Clinton during his 1992 presidential campaign. Later, Ricci founded Directional Aviation, which is the parent of such prominent private aviation companies as pioneering business jet remanufacturer Nextant Aerospace; aircraft maintenance provider Constant Aviation; Sojourn Aviation, a global leader in aircraft sales; N1 Engines, a provider of turbine engine services; and the OneSky portfolio of private jet travel providers including Flexjet, the world’s finest fractional private jet ownership provider; jet card pioneer Sentient Jet; and digital on-demand private jet charter providers Skyjet and PrivateFly. Collectively, the Directional Aviation companies currently employ more than 2,200 people; generate more than $1.5 billion in annual revenue; service private aviation needs in more than 70 countries around the world; and operate more than 175,000 flight hours annually. Directional Aviation has continued to expand. In 2018 alone, it made three major acquisitions that will help shape the future of global aviation including PrivateFly, a leader in on-demand private jet charter in Europe; Sirio S.P.A., which will serve as the platform for Flexjet to grow substantially in Europe; and SIMCOM, which is the largest independent provider of flight simulator-based training services for the global general aviation, business aviation and regional airline markets. Ricci’s pledge of support for the Kiddie Hawk Air Academy, which the Living Legends of Aviation helps to support, follows his commitment to other philanthropic causes including Able Flight, which provides people with disabilities a way to challenge themselves through flight and aviation career training; the search for a cure for Cystic Fibrosis; and the expansion of educational opportunity. In order to increase opportunity, Ricci has pioneered a new form of giving – called a Philanthropic Succession Partnership – that he used in 2017 to donate $100 million to Notre Dame, the largest such commitment ever for that iconic university. In 2018, Town & Country Magazine named Ricci among the Top 50 philanthropists for his charitable work. Directional Aviation Capital is a private investment firm whose singular focus is private business aviation. Combining strategic aviation ownership, unmatched experience and revolutionary vision, Directional continues to innovate and reshape private aviation. Directional’s unique industry expertise enables them to quickly understand business aviation companies and provide the financing and operational strategy needed to take advantage of evolving market opportunities. Many of the world’s leading private aviation companies are proud to be part of our family. Directional’s OneSky portfolio of private jet travel providers includes shared ownership/fractional jet ownership, jet card, membership and on-demand charter providers. Industry leaders representing MRO, private jet remanufacturing, aviation parts distribution and more also make up the Directional family. Directional Aviation is charting the course of private aviation, worldwide. For more information, visit www.directionalaviation.com.